I think today is a Gene Kelly kind of day. I think I'll watch Singing in the Rain tonight while Dan works on his homework. I might work on a project too. 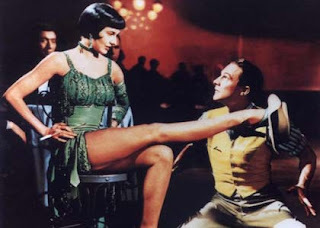 I'm going to imagine that I'm dancing with Gene Kelly. I haven't seen Singing in the Rain since Mrs. Montgomery's 5th grade class. Remember we got to watch it in the library? I loved it then. I should probably see it again. After all, it is a classic. Have fun tonight. Wish I could watch it with you. Mrs. Montgomery was cool. Amy, you should watch Singing in the Rain and American in Paris. When Ada grow up you will have a slumber party girlfriend all the time. Won't that be cool? I wish I could watch them with you too. But, I think it would be more fun to watch Grease 2 and Connie and Carla if we were together for a night of fun. We could rewind all of the kissing scenes. Did you know she is always bending her knees dancing in that one scene because she was taller than him? It's true...crazy huh - they choreographed the whole dance based on his height! 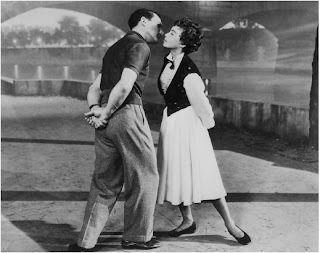 Ahh, dancing with Gene Kelly. That sounds like a good time.